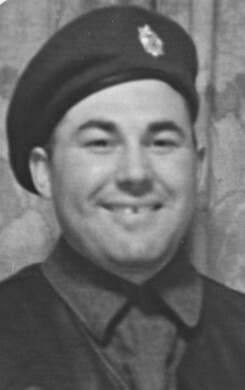 English-born Fred Barnett of Lot 7, Concession 6, served with the Royal Canadian Army Medical Corps in England, France, Belgium and Germany. While stationed in England, he married English born Isabel Gibson. After the war Fred returned to West Zorra and Isabel followed shortly after. They farmed for a while in West Zorra and then purchased a farm in East Nissouri Township. When Fred retired they moved to Embro, Ontario.